I love jewelry and enjoy how it can change the look of an outfit. I prefer some types of jewelry over others. One type I love is sterling silver so when I visit Beautiful Silver Jewelry online, it’s like a kid walking into a candy store. I want it all!! Beautiful Silver Jewelry has been online since 2000 and offers quality sterling silver earrings, necklaces, bracelets and genuine semi-precious gemstones in creative fashionable designs that you will love to wear. Jane Ingraham is owner/designer of Beautiful Silver Jewelry and she is one talented lady! Her jewelry is simply breathtaking. 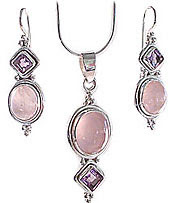 This one is stunning- it’s the Diana Rose Quartz and Amethyst Jewelry. 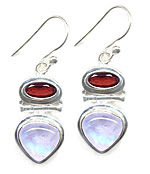 I’m also drooling over the Sterling Silver Moonstone – Garnet Earrings. A unique pendant with undulating waves that sparkles with our premium diamond-like cz’s in pretty champagne and white. The starburst is attached with a loop, so it swings inside of the sparkling frame. All 925 sterling silver with quality rhodium plating for long-lasting, high shine and brilliance. Measures 1″. Our ‘Starburst’ Earrings match this pendant. 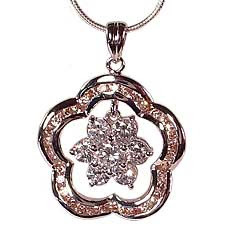 We guarantee you’ll love this pendant! $48. It’s even more beautiful in person trust me!! I think its a gorgeous necklace and it really does look like real diamonds to me. I’ve received many compliments already when I wear this necklace out and people also thought it was real diamonds. It does add an extra sparkle to whatever outfit you are wearing. I often just wear casual attire and I felt comfortable wearing this necklace with it. It would be even more beautiful I imagine in an evening gown. The price is excellent!! Beautiful Silver Jewelry doesn’t have an actual physical store so they have much lower overhead and can charge lower prices. Instead of keeping the prices high, Jane Ingraham, the owner/designer, has decided to pass that saving on to her customers. I think that is really awesome of her to do that! I also like the fact that they offer a 30 day No Questions Asked Guarantee so you can send it back if for some reason it isn’t what you wanted. I like businesses that honour good customer service like this. If you are interested in purchasing one of these beautiful creations or browse her other work, please visit Beautiful Silver Jewelry. Beautiful Silver Jewerly has offered my readers a 10% discount on your purchase. Enter the voucher #4069095559 into the ‘Voucher’ area on the first page of the shopping cart order form, then click ‘Recalculate’ to see your new amount. This discount will be good for the duration of the contest. Mother’s Day is coming up soon and they have some gorgeous jewelry that any woman would love!